The purpose of this tutorial is to show you how to populate a RadComboBox with data from a .NET RIA Service. Create a new application and add a RadComboBox declaration in your XAML. The ComboBox will be bound to a DomainDataSource. 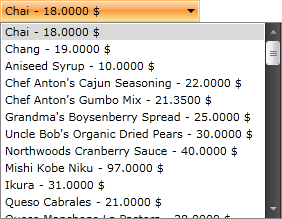 When the control is loaded, all Products from the Products table in the Northwind database are loaded asynchronously. Declare a new DomainDataSource object in the resources of your application. Set its DomainContext property to an existing RIA Service.